I’m continuing to try to step up my game in the kitchen in terms of both cooking and meal-planning. I am still using Blue Apron on the regular to provide our meal ingredients and menu two days a week. And my month of doing Whole 30 definitely inspired me to try new recipes and increase my skills when it comes to meat and veggie prep. I’m no longer strictly Whole 30, but I’m leaning in that direction, and Blue Apron is great because their meals are definitely based on healthy, whole foods. 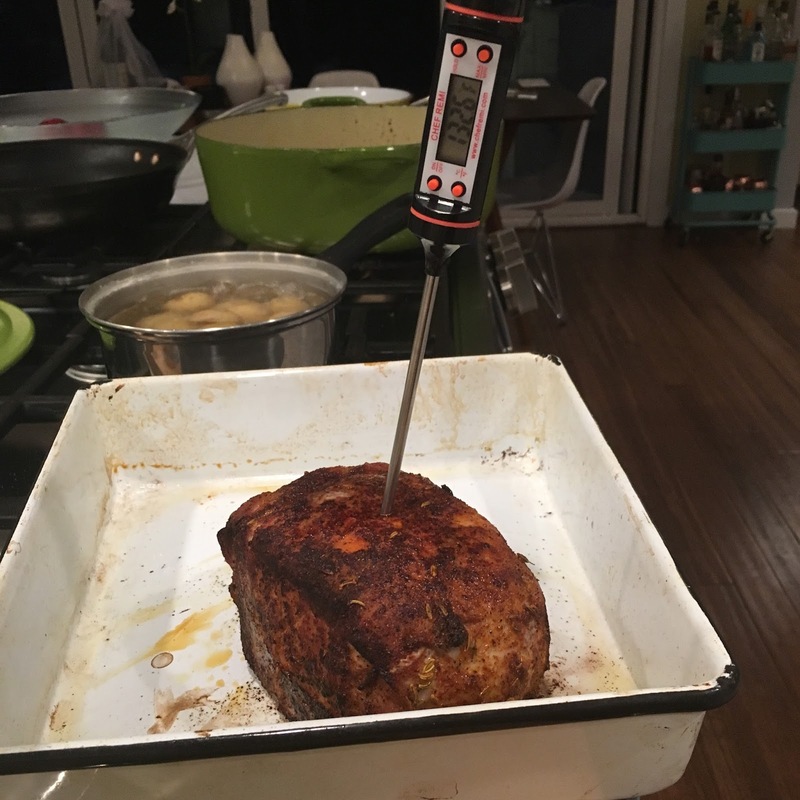 My most recent step in the kitchen was investing in a meat thermometer. This might be old hat for some of you, but it was a big deal to me. I’ve never used one in my life, but I’m really liking some of the pork roast dishes I get from Blue Apron, and wanted to make sure I was cooking the meat well without overcooking. It’s a delicate balance to find when you don’t have a thermometer. I got to try it out with a Blue Apron meal this week. 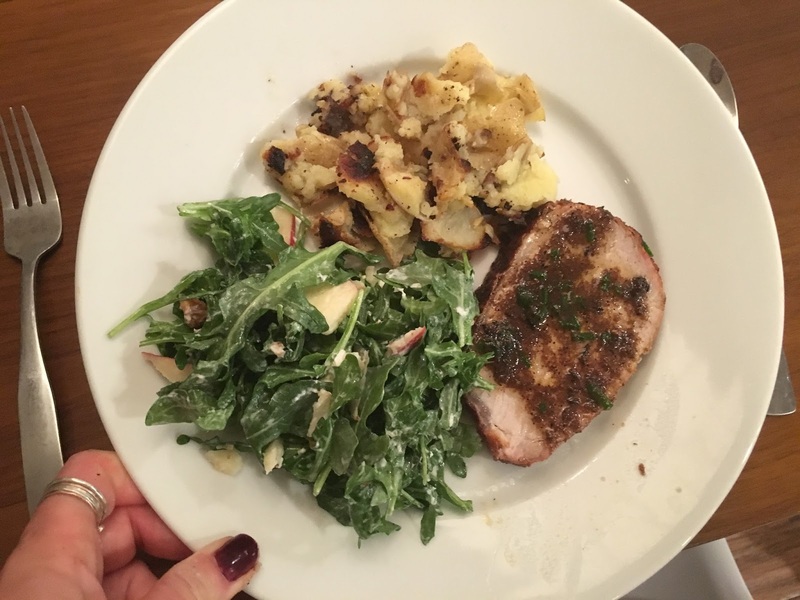 The meal was Roast Pork & Smashed Potatoes with Apple, Walnut & Goat Cheese Salad . . . a perfect opportunity to try the meat thermometer. I might have been nerding out over it just a little bit. As a result of this little gadget, the pork roast was perfectly cooked, but not overdone. It was still moist and juicy, but thoroughly done. While that was cooking, I finished the salad and the potatoes. 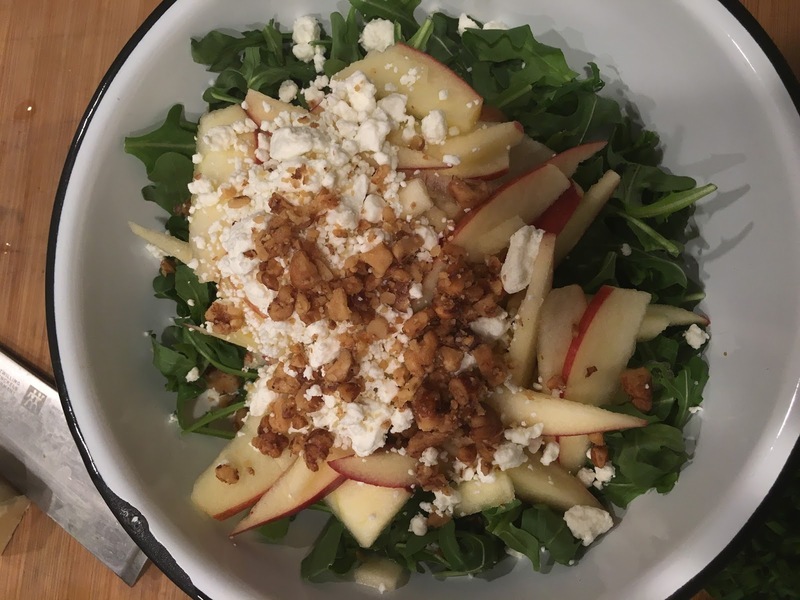 This salad is one I want to make again and again. The tang of goat cheese and lemon and the sweetness of the apples . . . such a great taste combo. This meal was a hit all around. I have mentioned this before, but I truly believe that practicing and following the Blue Apron recipes has made me a better cook. The recipes are advanced. They aren’t too hard . . . I’ve never taken any classes and I’m able to master every dish I’ve been sent. But they are a challenge, and it has really stretched my abilities in a good way.This meal was another example. If you would like to try their service, Blue Apron is offering the first 50 readers two free meals on their first Blue Apron order. 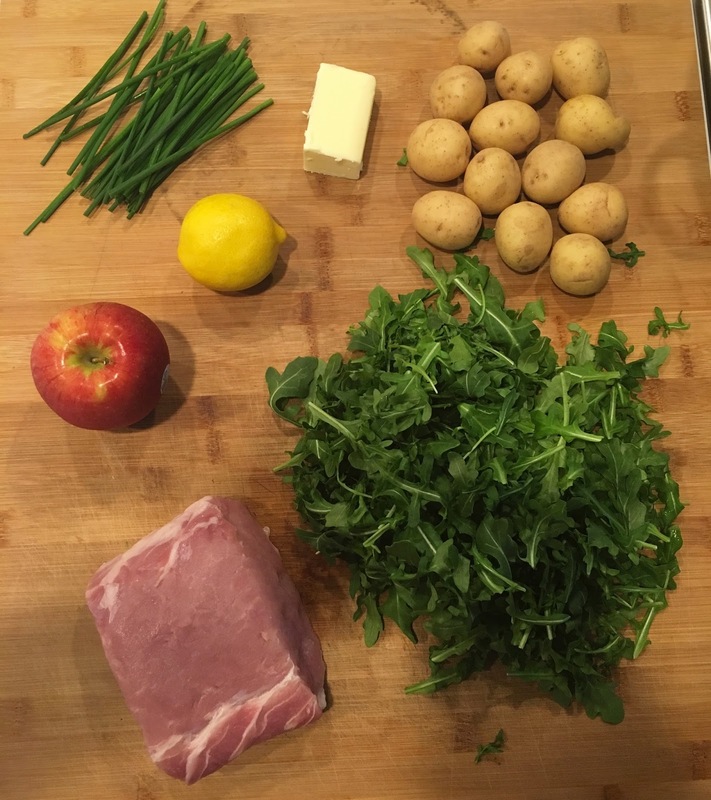 My 10-yr-old begged me to get Blue Apron for months. I finally caved. She and my 12-yr-old have cooked all of them so far pretty much by themselves. Meaning Mommy gets two meals off each week! They're making the pork and smashed potatoes dish today.